As featured on Oguntê – Impact Women. 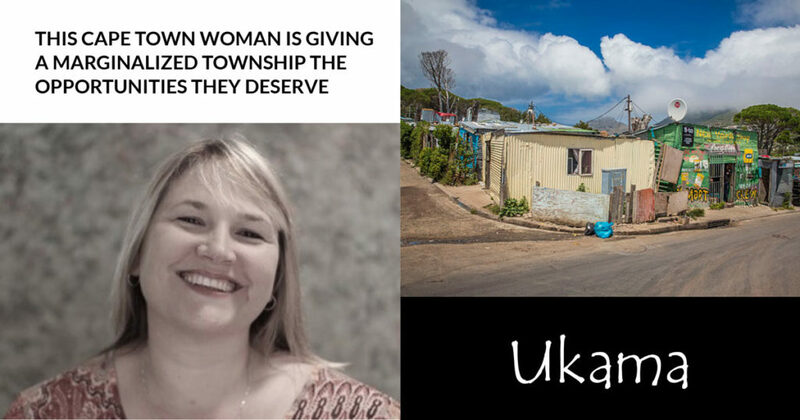 Vrygrond is a town that has been hit hard with poverty, insecurity, and drug dealership, and this is the place where Janine Roberts decided to establish Ukama, the business model that is set to benefit the poor. Janine strongly believes that marginalized communities have so much more to offer if only given a chance. Here, she explains how exactly Ukama works, and why she decided to give small communities a chance. South Africa has so much to share. Janine Roberts, founder at Ukama, a social venture that counter balances general poverty in Vrygrond township. Just 30 minutes from Cape Town City Centre is the township of Vrygrond. Known as one of the poorest townships in the Western Cape, it is home to over 40 000 inhabitants. Despite being a place plagued by gangsterism, drug and alcohol abuse and (according to the 2011 Census) over 40% unemployment, Janine decided to set up Ukama Holdings in a business park bordering Vrygrond, in 2014. With her 12 years in the packaging industry and 6 years dabbling in entrepreneurship she decided to set up a unique social business model. Her belief is that the generational poverty in townships across South Africa can be overcome only by education and empowerment of previously marginalised people. What do you do at Ukama? At Ukama, we identify, train and mentor previously unemployed people to run their own micro enterprise. Ukama acts as an umbrella company supplying food safety certification, premises and a training and coaching hub, and most importantly the clients. We service the local and international food markets, supplying food contract packing services. The Ukama business model is aimed at supporting emerging black businesses through the incubation program so that they are able to emerge as independent, viable businesses. We do this by offering ongoing support of the micro-enterprise owner. Each micro enterprise employs around 5 people from their local community. In the 16 months since its inception Ukama has helped over 60 people escape unemployment and poverty. Our company is a registered (Pty)Ltd company and we have a Foundation registered as an NPO which feeds over 100 children per day in Vrygrond, tying into our community upliftment ethos.